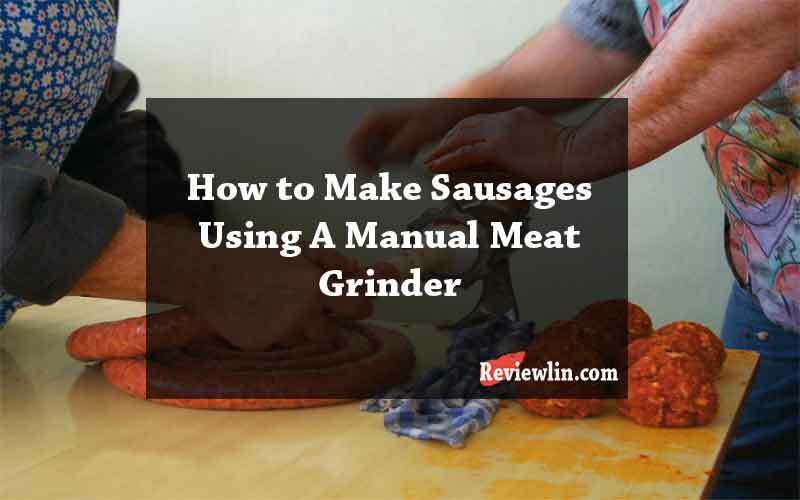 How to make sausages with a manual grinder? How to Choose A Suitable Manual Grinder? Aren’t sausages the ultimate meat lover’s delight? Don’t they have magical powers to rejuvenate our taste buds? Well, yes no matter how you like them boiled or stir-fried, sausages would still taste amazing no matter what! And now imagine how it would be if you prepare your sausages at home! Now, you can’t really chop the meat into tidbits with a knife, if you want to make sausages; you have to mandate the utilization of meat grinders. And what can be better than a manual meat grinder for this purpose? Since you have reached the heart of this blog, you should know that sausage making is not a tedious task. If given a hint of focus, it can make you overwhelm and content. You would require 1-2 knives for stripping the fat off your meat and then chopping them into medium sized chunks. But Leaving a little amount of fat on the meat would take your taste buds on an exotic destination. Get hold of a food scale to measure the appropriate amount of chunks required for the meatloaves serving. Before putting it to the grinder, choose a suitable plate. If the meat is tender you must choose the fine plate and if otherwise then the coarse plate. You have to stuff the meat with a little pressure into the hopper. You have to adjust the hand-crank which will in turn twirl the auger. In doing so the meat goes through the cross knife and ultimately is led to the blades from where it comes out minced. You would be dealing with animal casings to hold the meat tightly. Soak it in warm water and rinse it multiple times to ensure it’s completely clean and germ-free. If you don’t think animal casings to be a palatable choice then opt for artificial casings. Give the recipe book a good read to determine the number of seasonings required. Even if you love your sausage spicy, adding too much of any spices is not recommended. You can also buy mixed sausage spices available at any grocers. If you are too lazy to make spreads and dips, buy that as well. After mixing the seasonings with the sausage test cook little of the unbounded meat in your skillet to analyze its flavor. For this step, you would require a sausage stuffer to push the contents into the casings. Make sure to grease the insides of the casings with a little vegetable oil to make the process easier. Now you would have to close the open end of the casing either using a hog ring or knotting the casing itself. Take a good look at the sausage you made and notice any air pockets. If present, get rid of it by using a sausage pricker. Now is the time to determine the link length. If you feel you have stuffed enough and now is the time to fasten the knots of the links then do it instantly. If you think you might mess it up, use a hog ring instead. Yes, now your sausage is ready to be cooked. Boil it grill it or refrigerate it. If you are a beginner and want to make a successful first attempt then go for simpler ones like manual grinders. If you are unsure about the brand and price then you can search for the Best Manual Meat Grinders online which are simpler and designed for amateurs. With a manual grinder, the process tends to be somewhat slow and time-consuming but you will perceive and gain a better sense of what you are doing. But with this, there is little chance for you to screw things up. Depending upon your skills you can alter the speed of the grinder as well. Whereas for the electric meat grinders, some expertise is required otherwise things could fall apart. There is no hard and fast rule to confirm this but if you can keep the following basic points in mind, getting a splendid manual meat grinder will be quite easy for you. Ease of Use and Cleaning– Ease to maintain models of meat grinders are always a plus – you won’t need to struggle with cleaning it. Accessories– Common attachments are found along with most of the meat grinding models. Make sure you choose a model that comes with functioning accessories. Check reviews – And you can check for reviews online as well, to analyze if the product is yay or nay! Going for a renowned brand would ensure that even if one or multiple parts of the grinder malfunctions you can get it exchanged because the parts would be available in the local stores or online. Preparing sausages at your home using a manual meat grinder entails a list of benefits that are worth checking out. Hygiene is the primary and essential factor that first comes to mind. Having a manual meat grinder to prepare sausages at home lets you control the hygiene and safety of the food. Every time you wish to eat sausages, you will not have to rush outside to buy it. Being able to prepare your own sausages makes the whole affair pretty economical in the long run. You can also move a step ahead and prepare a barbeque dip to coat your tender sausages. And the next time your friends come in for a feast you can easily show off your newly earned chef skills. So don’t wait anymore, buy a manual meat grinder right away and indulge your love for sausages!